I know what most of you must be thinking. Stop! No more! Lalalala I’m not listening! We are so sick of hearing about Brett Favre. Really? 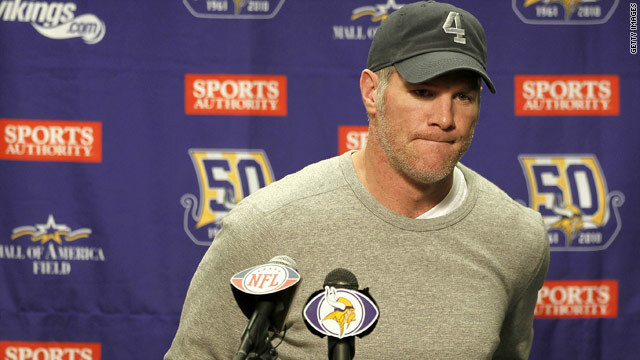 Much like Tim Tebow, Brett Favre will not go away for one simple reason. You guys. 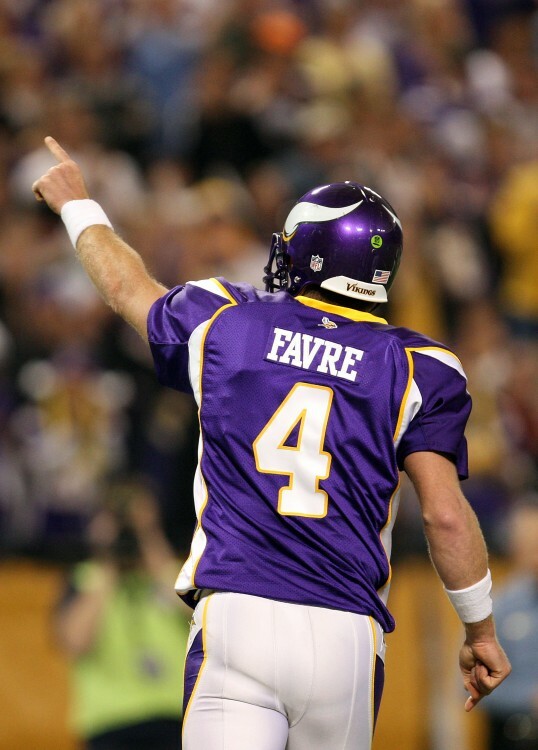 Whether you love him, or most likely hate him, football fans have an infatuation with Favre. Despite being out of the league since 2010 and being 42 years old, the Brett Favre rumor mill is rampant once again. It all started with Favre’s agent saying this week that Favre is better right now than 5 current starting NFL quarterbacks. I’m no Jerry Mcquire, but it sounds like someone is trying to pitch their client. With numerous teams with terrible quarterback situations this year don’t be surprised if one of them takes a shot on old man river. How about the Vikings? Favre’s last team whose subpar quarterback play has resulted in a 1-3 start and who are slowly realizing that Christian Ponder is not the answer. Sounds like an easy gig, hand the ball to Adrian Peterson, throw it maybe 25 times a game, oh and it’s the offense that Brett Favre knows. How about the Texans? With an elite running game and defense they’re a quarterback away from being a legitimate Super Bowl contender. Favre would be a better quarterback then Matt Schaub who has had three games in a row with a pick six. Tampa Bay? Another team that was supposed to be stacked finds itself in a quarterback mess with Josh Freeman already being benched a quarter of the way into the season. Want a real dark horse? How about the Bengals? With a weak AFC North and a loaded roster this is the year for the Bengals to make a run. With Big play makers at the wide receiver, running back, and tight end positions Cincinnati could make Favre feel like a kid in a toy store with the weapons they have, especially A.J. Green. Maybe the Bengals feel Andy Dalton isn’t ready yet or he might not be the quarterback to lead them to the promise land. Another dark horse? Very well what about the Tennessee Titans? They’re going to miss Jake Locker for a major portion of the season, maybe Favre could keep them in the hunt? They’re already off to a 3-1 start why throw in the towel with Ryan Fitzpatrick. With Favre, you never know what he’s thinking. While he denies that he would comeback, how many times has he “retired” only to come back a few months later. We know he’s a competitor and that he’s got the itch to play. Come on he still has plenty of years to mow the grass or coach high school in Mississippi. Plus, look at Peyton Manning. He’s having his best season ever at the age of 37. You don’t think Favre must be thinking in the back of his mind that he could still be great even at 42. But Nolan, he’s 42, there’s no way he’s in football shape! Tell that to Favre’s agent who has been saying that Favre works out everyday, still has a rifle arm and has a body fat of content 7%. Favre is country strong. He’ll always be in great shape because he was raised to be “country strong”. All those years of bailing hay, chopping wood, and pulling tractors has given him strength that will never go away. Let’s put it this way, Favre will always have the ability to throw the ball 60 yards without a problem. Sure Favre may come off as the diva prom queen who doesn’t want to leave dance even though the janitor’s sweeping the floor, but shouldn’t we admire Favre a little bit? Sure we know that he’s past his prime and should be retired, but shouldn’t we respect him for trying? He’s the Peter Pan of football. No he doesn’t have twinkle toes, but he doesn’t want to grow up and just play football forever. Any of us who have played still wish we could play. We all grow up or out of sports eventually. Some are told at a young age some are told latter in life, but eventually we are all told. Can’t we just look past the diva whose back and forth decision-making drives us crazy and just pay Favre some respect that he doesn’t want to stop playing? He’s not doing it for us, or for more glory, if he comes back he’s doing it because he loves playing the game of football. Sure it’s a long shot that he comes back, but just a few years ago we thought he would always retire a Packer or fathom him in another jersey. Well those have both happened and as this season continues to unfold don’t be surprised if Favre trades in his Wranglers for shoulder pads once again. There is just too many good opportunities for him to play quarterback and a franchise that may decide he is there best chance to win in 2013. Now we all just have to wait to see what number 4 will do next.